Custom Actions are a powerful and flexible option which allows you to automate repetitive and manual remote IT support tasks. It is an extension of the existing set of Goverlan Reach features, part of the IT process Automation framework. It allows you to configure a set of reports, modify and execute actions in one package and execute it on one or more users or machines as needed. A custom action object can be configured to perform many highly customized tasks. For instance, you can configure a custom action to modify multiple registry settings, perform file operations or install MSI packages on a machine or a set of machines. Why are Custom Actions Practical? Many features provided by Goverlan can only be executed on a single object at a time. 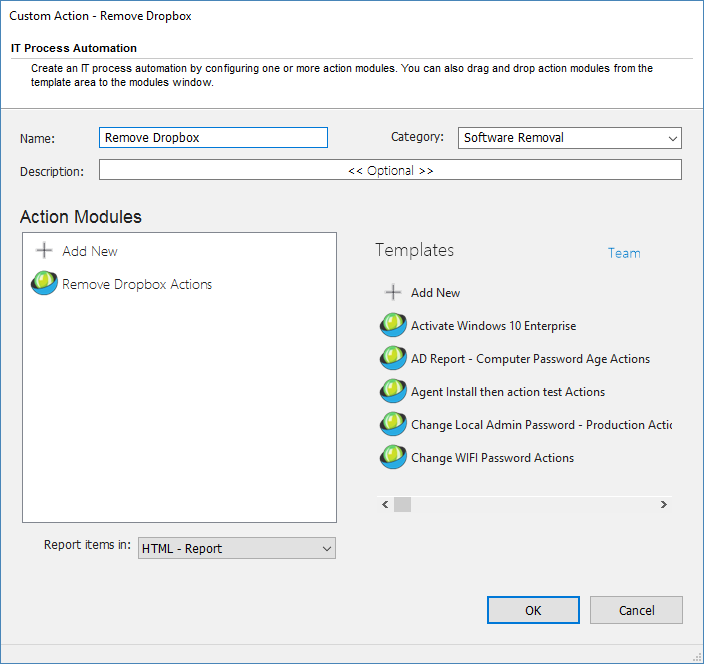 A custom action is practical because it can be configured to perform advanced actions on multiple computers or users at one time. Let’s use an example: Goverlan provides a Shutdown Computer task. You can execute a Shutdown action by selecting this task from the context sensitive menu of a Computer. However, the Shutdown feature can only be executed on one computer at a time. If you were to open the context sensitive menu of a selection which includes two or more computers, the Shutdown action is no longer available. If you want to execute a Shutdown of multiple computers, simply create a Custom Action which executes a shutdown and select this custom action from the context sensitive menu for one or more computers which have been selected. Custom Actions can be configured to perform many actions sequentially. You can also apply conditions to the actions. This allows you to create sophisticated action packages and make them readily available in the user interface. 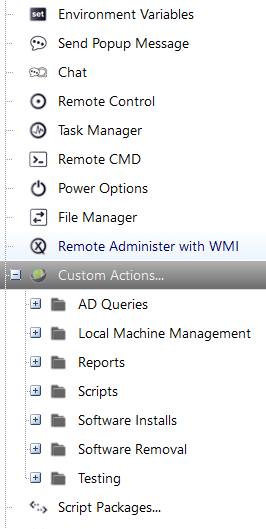 A Custom Action provides access to the properties and methods of every WMI Class available in your local repository. A Custom Action provides access to every Active Directory attribute of a user, machine or group. If you often need to query an Active Directory attribute not displayed by the native Goverlan interface, simply configure it as a custom action. A Custom Action can be configured to query and manage any registry key or value as well as file system objects. A Custom Action can either be bound to users or computers. A Custom Actions list is available for each user and computer object. Adding a custom action to either a user or a computer makes the custom action object available to all users or computers under the Custom Actions category. Description – Enter a description for the custom action. The description entered in this field is used when generating custom action reports. Category – Assign the Custom Action to a category for quicker organizing of actions. A Custom Action must contain a least one Action Module. 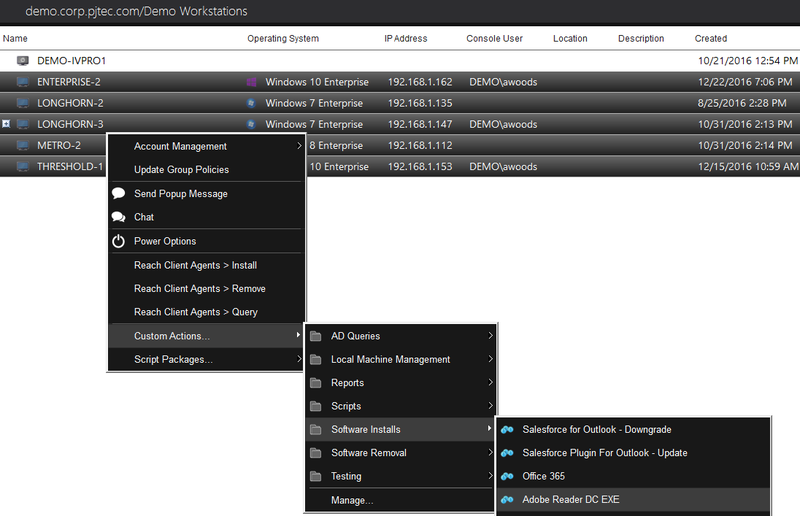 Each action module defines a set of actions which can be used to report information, modify settings or execute tasks. Even though you can mix report, set and execute actions, it is rarely needed. Custom Actions are more commonly configured to either run reports, sets or to execute actions. You can also drag and drop any previously configured Action Module template to define your actions. If you have configured one or more report actions, use the Display any configured report items in option to specify the desired output format. Generate a report in HTML format. This model generates a data card for each child object contained in the report. For instance, if you select to report information on the local drives, each drive with its information is presented in its own section. Generate a report in HTML format. This model presents the information in a table format. The selected information attributes are set as columns and each row contains the information for a object. Since all objects are inserted into a single table, this format is perfect for side by side comparisons of attribute values. Generates a report in text format and outputs it to a single text file. This format is convenient if you need to send the entire report by email. Open with Microsoft Excel (only available if you have Microsoft Excel installed on your machine). Once you have configured the custom action, click on the OK button. The new custom action is then accessible under the Custom Actions list of every respective user or computer. You can run a custom action on a set of users or machines in both the main views and from the Search Panel result list. Simply select multiple objects from the view using the [CTRL] or [SHIFT] key, right click on the mouse and use the Custom Actions… sub menu. Once all Goverlan Consoles are pointing to the same Database, you can share your custom action to make them available to other Goverlan users on your network.